My friend didn’t know about ‘peak times’ so we assumed that tube trains within London didn’t have travel restrictions based on time of travel. How could this Italian distinguish between tube trains and other trains when they use the same stations? Should we say ‘you can travel on the grubby looking trains that are travelling around London, sort of, at any time”? I felt daunted. Such a simple question, such a complex answer. really difficult to remember even if you can work it out in the first place. When I asked a train station employee at Reading main station he whipped out a PAPER leaflet that listed trains that travel at peak times but accept off-peak time tickets. This work-around suggest that the service providers recognise the problem. The cute, archaic, work-around made me smile. But why not make it easier for the traveller in the first place (or time)! I know what name I’d like to give the ticket pricing and travel system, but that’s unpublishable ….. This scribble was published on Saturday, October 15th, 2011. You can follow any banter on this scribble with the RSS 2.0 feed. You can share your inspired musings after typing the anti spam word near the bottom of the page. But no Pinging because its too naughty. The Long Island Railroad into New York City has two and a half of the same criteria. Time and direction are both counted, with peak time going into the city in the morning and out in the afternoon/evening. Technically, service provider counts too, but the stations are separate enough (LIRR & subway) that there’s no confusion, so I’ll count that for 1/2. If you mistakenly have an off-peak ticket they’ll make you pay the difference on the train. Used to be the conductor could give you a break if he felt sorry for you, but now they’ve cracked down on that sort of thing. But if you didn’t know, you could try; worst case would be you’d be asked for more money. 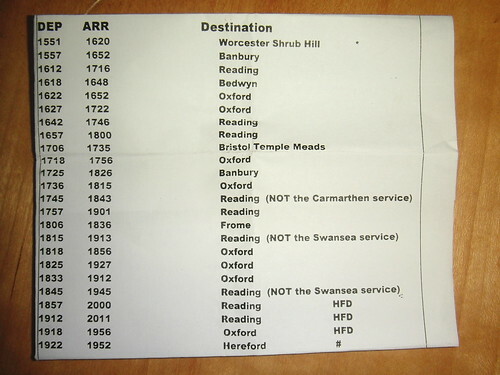 They do have paper lists but you can pick those up in the stations, nothing special that only the conductor sees.